Chrichton's World: Review Point Break (2015): Brother Bodhi saved my life! 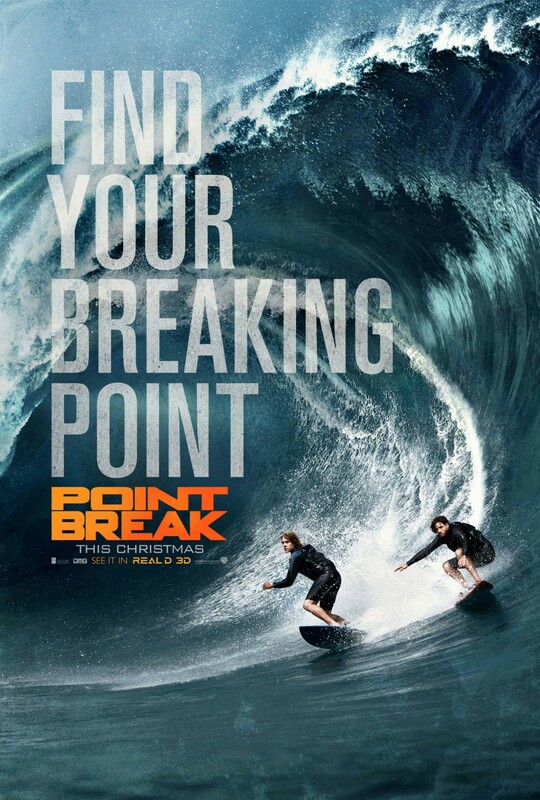 Review Point Break (2015): Brother Bodhi saved my life! Nah, I was kidding about Brother Bodhi saving my life. I just wanted to point out the stupidity of the characters and their life philosophy. There is nothing philosophical about doing extreme sports. Do you really need to jump of a building to get the best out of life? Give me a break. All the mysticism surrounding this sports is just an excuse to give some weight to their motivation of taking part because deep down they know it's just about the thrills. Which brings me to this film, unfortunately. This remake of Point Break is devoid of those. There is no thrill or any fun to be had by any of the action scenes in this film. And I know some of you might be wondering how that could be possible with all the surfing, wing diving and motocross racing? Let me tell you. Most of these action scenes lack an emotional component. You are not invested in any of the characters on the screen. I tried, god I tried. But after hearing just a few of the dialogues I could not take anything seriously. It was already a stretch to believe that the robbers in this film would go to such dangerous lengths to steal money and then discard it like it didn't mean a thing. Oh I get how they want to convince us that there are some people who care more for their spiritual needs than material ones. But exactly how are you going to fund these kinds of robberies? Extreme sports and travels around the world aren't very cheap are they? And what about taxes and medical bills? I did not see these people grow plants, vegetables or keep animals for milk or fur. So how exactly are they supporting themselves? Hang on, they were sponsored. That's right they could live of what they made by being sponsored doing illegal activities? Sure! Anyway the plot is a mess. Right from the start they got Utah wrong. Now he is made into someone who is into extreme sports himself. The whole excitement from the original Point Break was the fact that outsider Utah played by Keanu Reeves had to convince this elite group of surfers that he could be part of them. He had to do a little more than Luke Bracey's Utah. He simply went to them and introduces himself and got accepted very quickly. He was being called brother with none to very little conflict. At least in the original they gave Keanu's Utah an incredible hard time and were paranoid about him. It gave the original a lot of suspense. Here all of that is negligible and it makes the dramatic impact Utah is having incredibly laughable. Are they forgetting that in the original Point Break you weren't entirely sure what the deal was with Bodhi and co. Of course most people have seen the original and there is no point in hiding that. Would it have hurt to give it another spin? Apart from the inclusion of the extreme sports no attempt is made to do something original. The so called spectacular action scenes only are exciting if you are into extreme sports. I am not a fan so it basically felt like watching wet paint dry. Did I mention the dialogue? I probably did but seriously for a film that is all about the action there is too much dialogue. And all that quasi philosophical and religious mumbo jumbo gets tiring real fast. I was prepared for this film to be disappointing. But this is just embarrassing. You are better off watching the original. That one is vastly superior and at least had the sense to avoid pretension. They made sure you know that it was all about the action and the adrenaline and nothing else.